cardamom | What's for tea tonight dear? I’ve updated the original with my latest tweaks, and there’s still time to make this for Christmas. I was quite surprised when I first found a recipe in one of Gary Rhodes’ books for Worcestershire Sauce, given that this is supposed to be one of world’s best kept secrets, the recipe only discussed by ‘those who know’ in the middle of a field. Anyway I made it as per Gary’s instructions for several years and it always went down very well with people who received it as a Christmas present – very good for cheese on toast apparently, as any Worcestershire Sauce worthy of the name should be. And then the there was the bombshell in 2009 of a Lee and Perrins employee apparently finding the original recipe in a skip! So much for the field, but frankly little we couldn’t have already deduced from the label, which brings me back to Mr Rhodes. Why, in his recipe, did he ignore so much of what the bottle already tells us about its contents? He includes no molasses or tamarind. I have added them back in, along with one or two touches of my own. So whilst I don’t think Lea and Perrins should shut up shop just yet, if you fancy spicing up Christmas for your nearest and dearest you’ve still got time. Place the vinegar, shallots and garlic into a pan and slowly bring to a simmer. Dribble in the treacle and stir well to dissolve, then allow to tremble gently for twenty minutes or so. Add all the other ingredients and stir well then cook for a couple of minutes more. Take off the heat and allow to cool slightly as you warm a large glass jar in a low oven. Pour the warm mixture into the warmed jar and seal. This now needs to sit for a week, ten days, or even a fortnight, and should be shaken each time you pass the jar. Mine sits on the washing machine so that the spin cycle can shake it for me when I’m out. When ready strain through a fine sieve, heat until just below simmering for two minutes, and when still warm decant into heated sterilised bottles. Never pour hot liquids into cold glass bottles, or cold liquids into hot ones – they should both be quite warm. Then seal and keep somewhere cool and out of direct sunlight until needed. There will be some sediment and you’ll need to shake the bottle before each use. I’d also keep the bottle in the fridge once opened. Now then, who’s for cheese on toast and a Bloody Mary? * If you saw my piece on Uyen Luu’s cooking class you’ll know about my conversion to proper, good quality fish sauce, and I wouldn’t dream of using cheap nam pla here. 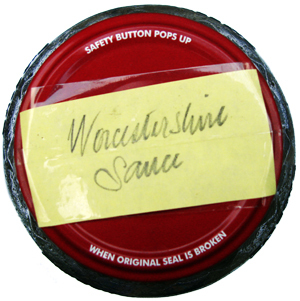 I was quite surprised a few years ago to find a recipe in one of Gary Rhodes’ books for Worcestershire Sauce given that this is supposed to be one of world’s best kept secrets, the recipe only discussed by ‘those who know’ in the middle of a field. Anyway I made it as per Gary’s instructions for several years and it always went down very well with people who received it as a Christmas present – very good for cheese on toast apparently, as any Worcestershire Sauce worthy of the name should be. And then the there was the bombshell in 2009 of a Lee and Perrins employee apparently finding the original recipe in a skip! So much for the field, but frankly little we couldn’t have already deduced from the label, which brings me back to Mr Rhodes. Why, in his recipe, did he ignore so much of what the bottle already tells us about its contents? He includes no molasses or tamarind, and I was a tad sceptical about some of his other ingredients. Mushroom ketchup? It’s practically another version of what you’re making. I think he might be on to something with the mushroom flavour though so when it came to concocting my own I have added some dried porcini for their savoury depth. Yes, I’ve scoured the various printed and online versions I could find and have devised my own blend. It’s steeping now [this does take a little time to mature] so I can’t yet vouch for the final version, but the signs and smells so far are positive. I don’t think Lea and Perrins should shut up shop just yet, but if you fancy spicing up Christmas for your nearest and dearest you’ve just about got time. A few drops of ‘colatura di alici’* – strictly optional, and only if you can find any! As I say this is a first outing for my new recipe and there are likely to be tweaks and twists with future batches. Do check back in the new year, and please feel free to leave your own suggestions as comments. * ‘Colatura di alici’ is an Italian condiment descended from the ancient Roman ‘garum’. It is made from fermented anchovies and contrary to the advice of the TV chef who I first saw use it is fiendishly difficult to find in the UK. If you have some by all means use it. If not don’t worry, there are enough anchovies included here to render it all but superfluous. Add an extra anchovy fillet if you feel the need.